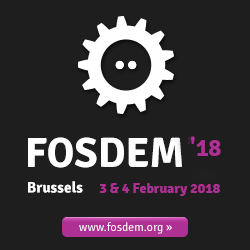 This Week-End, 03/02/2018 and 04/02/2018, It’s the FOSDEM. Like every year, It will be difficult to make my schedule. Lot of talks are interesting. ← Previous Previous post: Windows delete all personal certificates for the CurrentUser. Next → Next post: An other challenge ?